In this week's scholarly article pursuits, I read the March and July 2015 issues of English Journal. I've been a member of NCTE for a while and have a stack of these fantastic journals to catch up on, so I'm dedicating some of my reading to keeping up to date with research and practice for secondary English education. An article that stuck with me in this batch is "Peer Response, Remixed: Authentic Peer Response through Audio Technology" by Michael Hoffman in the March issue. 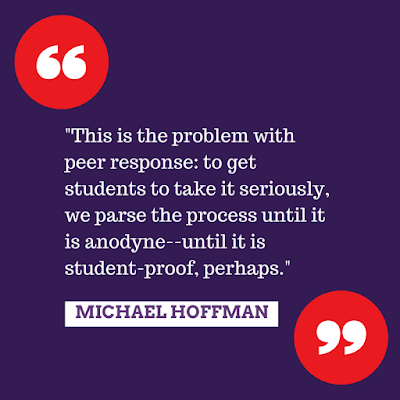 Hoffman posits that most peer response is too scaffolded and automated, to the point of being "student proof" and "manifestly free of investment." By focusing on structure, grammar, and mechanics, often through checklists, students (and perhaps teachers) "do not address the heart of writing: the message that students seek to impart through their text." One solution Hoffman offers is the remix, a concept which fascinates me. Instead of a canned and automated peer response, students create something new by augmenting the original text with something else. He compares this to the Beastie Boys' album, Paul's Boutique, which samples from TV, movies, music, and sound effects. "The remix in the classroom becomes a means for students to explore meaning and to create meaning that is their own. The anchor text remains in the possession of the original author, but that cannot be said of the remix. It is now a joint production, in which the student as reader and interpreter shares creative authorship and authority." Basically, the responder uses audio clips and additions to remix a recording of the original work. The writer records a reading of the piece, which the second student remixes. While this ideas fascinates me, it doesn't really serve the same purpose as a typical peer response or evaluation. Creation is essential but so is editing, revision, and evaluation. 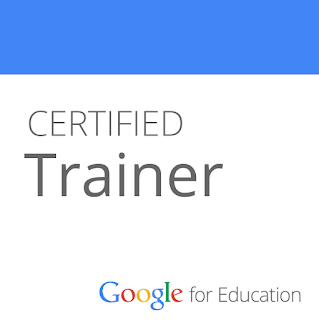 I've used a variety of peer review strategies over the past few years, ranging from checklists and conferencing and Google Forms to collaborative Google Docs editing and unstructured free responses. I agree with Hoffman's conceits, that these strategies often lead to a narrow and closed response, I'm not sure the remix addresses the real goal of most peer review. However, it still sounds like a lot of fun and a worthwhile act of creation. Instead of responding to mechanics and ideas, the students are truly creating something new. That said, I wish the article had links to some of the audio products his students produced through this work. 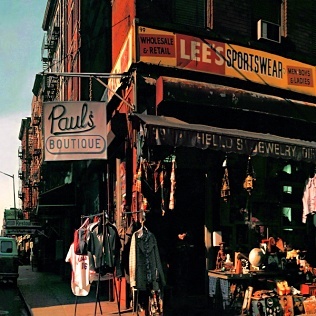 Beastie Boys' "Hey Ladies" from Paul's Boutique samples from over a dozen songs and has nearly the same number of allusions, according to this list. Hoffman mentions the band's work on this album as an example of a successful remix. Album art from Wikipedia. What really interested me in this article are the questions that Hoffman raises and hints at regarding student writing and peer response. He argues that peer response efforts should focus on the "most essential question for an author: Does this text achieve what I intended?" I'm wondering about the balance between teaching students to write in approved forms and structures versus allowing them to choose the form to follow function. But how often do our students truly understand their function or purpose? How do we help them get to this metacognitive point? How do we teach students to understand their purpose and intent as writers? Don't students often have the same overall intent? If all students are writing an argumentative essay, the intent is the same. Is this okay? Should the form and structure be the same, too? How do we balance the need for student empowerment, voice, and freedom with structure and scaffolding? How much freedom should we allow in writing? 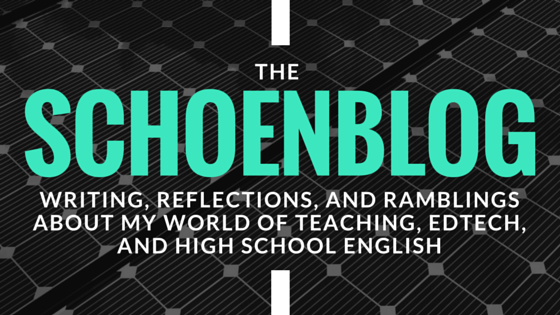 Is it better to start off by offering students freedom or restriction in writing? Where do we begin? 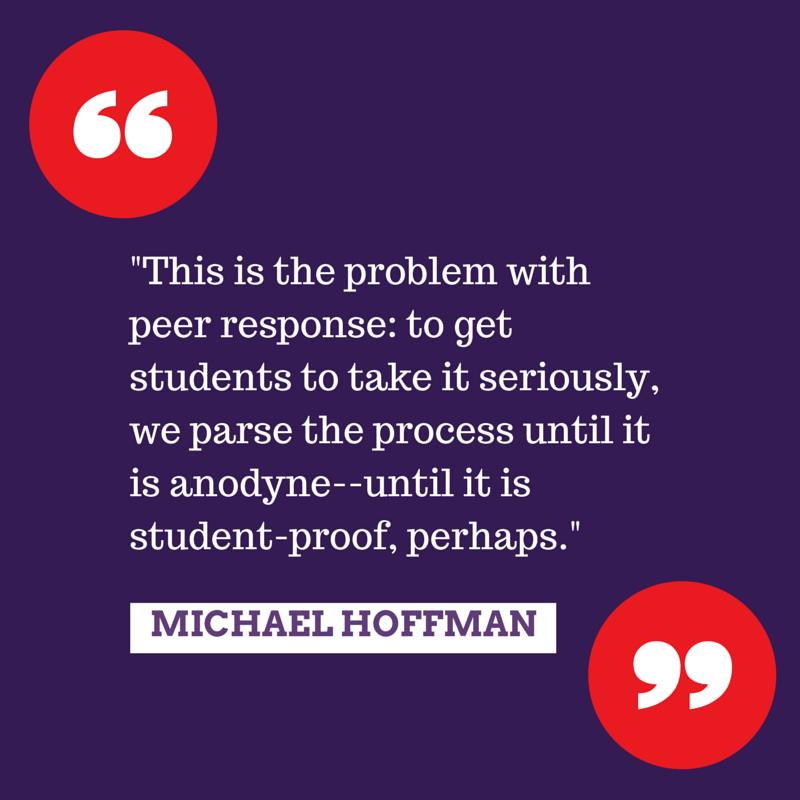 When and how are peer responses most valuable? How do we teach students to make positive and authentic contributions? I typically teach by students writing acronyms to help them structure their writing and find that it helps most students stay focused and organized. These acronyms tend to limit digression but not the development, unless the writer chooses to use them exclusively. It's an understand the rules before you can break them approach, and while it's been successful for me, I'm not sure that it's the best strategy. It may not be broken but I'm not sure it doesn't need some fixing. I want to think about these questions and issues and write about my answers one day, but for now, I'm purposefully leaving them unanswered. If you have comments, ideas, or answers, I would love to hear them. 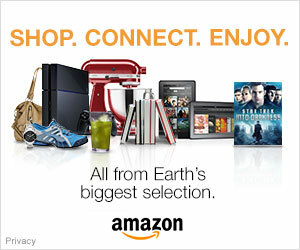 Please comment or reach out on Twitter!